At the push of a button the Magnum Lift System® quickly and convientiently raises or lowers your trailer, giving you the freedom to spend more time enjoying your adventure. 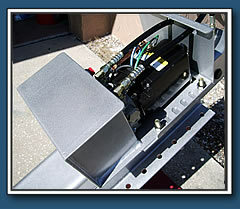 The Magnum Lift features a 24" stroke cylinder, capable of lifting 12,000 lbs. 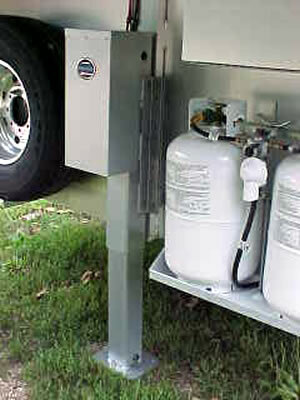 The adjustable fit bracket system bolts on to virtually any type of trailer. Movement is absorbed by the stable tube-in-tube construction which reduces stress on the cylinder seal. 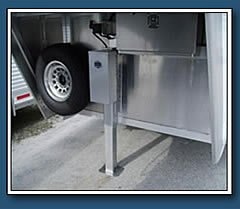 The durable 8" x 10" non-swivel foot stablilizes the trailer, while reducing movement and sinkage on soft ground. 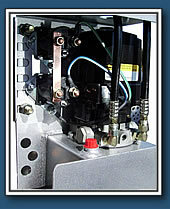 The Magnum Lift has a manual overide that can be operated with an electric or cordless drill.